Recent headlines: Yuma Arizona - Temps reach 120 degrees....115 in Phoenix; 107 in El Paso. Four hikers die of dehydration in Arizona........yes, the summer heat is upon us. I usually write an article on avoiding dehydration and the importance of drinking water about once a year as we get into the heat of the late Spring because it's important and an often over looked fact about life - that we need water, lots of it, and so do our horses. And everyone has heard of the old adege "You can bring a horse to water, but you can't make him drink. "....truth be known, the same is true for humans as well. A close friend of mine and I joke from time to time about how our wives and children sometimes complain about being tired or having a headache and how we always respond with "drink some water". They'll always respond "You always say that!". There's a reason why I always say that, because most people go around all day in some level of dehydration. Drinking water should be the first thing you try to alleviate symptoms. People normally quit drinking fluids a few hours from going to sleep, then after sleeping 5 to 8 hours, wake up in some sort a dehydrated state. The first thing you should do upon waking is to drink a glass of water! But most won't, and many horse owners put more thought and anxiety into ensuring that their horses have water than they do themselves. Some people even work their riding schedule around their horse's feeding times taking great care to ensure their horse has had a chance to eat and drink. This is not a bad idea, it's just it can be limiting. 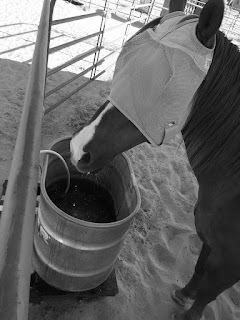 Feed earlier, feed lighter before a ride, measure the water tank to determine if the horse had a chance to drink,.....I usually rake smooth the area around a stock tank after throwing feed so I can tell if the horse has drank when I come back to pull the horse to saddle. Many times I have had to pull a horse and put him in a trailer before he had a chance to eat, so I'll hang a hay net in the trailer, after soaking the hay in water so he gets a chance to get something into his gut and some moisture before being ridden. I don't give horses measured amounts of water, I just ensure they have fresh, clean free choice water. People on the other hand don't drink the recommended daily amount of water which is about one ounce for every two pounds of body weight. For an 180 pound man, that equals about 6 bottles of water a day, and this is for body maintenance. When you are sweating (losing water) or doing hard work, the need for water goes up quite a bit. I know there is advice being given that recommendations for water intake are exaggerated and that you only need to drink when you are thirsty, but this is simply not true. You can be dehydrated, and pretty severely dehydrated without being thirsty. Not drinking water because of the inconveince of having to urinate often is just not, repeat, not a good idea. In fact, if you are not peeing fairy often, maybe once every 3-4 hours, then you likely need to drink more water. Same if your urine is dark in color. If you take supplements, you may have yellow or green urine, but after a few hours, maybe four to six hours, after taking your supplements, your urine should return to normal. I am not going to list all the symptoms of simple dehydration, but certainly if your mouth is dry, if you feel sluggish,...... or stand up from a sitting position, or dismount from your horse and you feel dizzy - then you need to get some water. Here's a tip - diet soda or beer, is not a replacement for water. Protect exposed parts of your body from the direct Sun; a cotton wild rag or neckerchef soaked in water and worn around your neck can help evaporative cool yourself. Silk wild rags don't hold the water well, but their are other fabrics available, as well as cooling scarfs available at most major hardware stores. As far as your horses, most of them are good to go for substantial part of the day after eating and drinking in the morning. If I work a horse in the heat, I let him cool off before I hose him off. I'll put him in a pen with water for awhile before I ever offer him feed. Again, I make use of water soaked hay in nets quite often in the summer months. Take a look at your horses' water tanks. Is that something you would drink out of? I have been to some high end training facilities and some of those stock tanks haven't been dumped and cleaned for quite a while by the looks of it. Sure a horse will drink dirty water when it needs to, but if that horse is in your care, why should it? Providing free choice clean water for each horse goes along way towards reducing chances of dehydration and colic.